Would I even be a "preppy blogger" if I didn't make some sort of comment about the Lilly for Target *scandal*?! The outrage! The drama! The upset, drama-ridden customers that have clothes determine their entire basis of existence! How will you ever live without a colorfully printed napkin?! Don't hate on me for this. Y'all know that I absolutely adore Lilly as much as the next girl. It makes me happy and I'll defend the brand until I die-- call it grandma-ish or basic all you want, but Lilly clothes are happy clothes and I love the values that the company stands for. When they announced they would be doing a collaboration, everyone flipped one way or the other. I understand the people that were excited-- it's Target, for goodness gracious, we all love Target (don't you dare lie to me and tell me you don't) and discounted prices for the brand we all love so dearly? Ummm, yes please! But I do understand the disappointment with expanding such a nice designer brand to something not as upscale. I really couldn't care either way, I'm not a snob, and the good Lord knows I can't afford every Lilly shift and would love to be able to buy one from Target. But expanding it to Target is a business move, one way or the other. Keep it at expensive prices and out of places like Target so that the value of each purchase is higher? Or sell it at Target and let people buy more of it at a lower price. Your move, Lilly, not ours. We don't know your business plan and we're not deciding your missions, so who on earth are we to judge anything an entire company decides? When they announced it in February, I was excited. I was excited to see what would happen with both the line and with the ever-loyal customers. Because we all know a girl that likes Lilly absolutely LOVES it. I looked at the lookbook and skimmed some of the blog posts about it, but honestly, I knew I wouldn't be buying anything because 1) even as inexpensive as some of their items are, I just don't really have the money to spend on much right now and 2) I wasn't getting up that early for what could be an overall disappointing morning. Sorry not sorry? But I know a lot of you, whether you're just a Lilly lover or a close friend, were excited about it and had planned for it. Nothing wrong with that, we all love a good deal and if you love it, you love it. But you know what's not cool? Acting like this is all you absolutely care about. That not getting your pieces determines all of your day and week. We get up for the online Lilly sales and know that the site crashes and that pieces sell out quickly. Ummmm, welcome to modern day. Sorry the Internet and every site isn't catered towards your every need. And sorry that the Target/Lilly site crashed for a little bit; there are always technical difficulties. I know there were a lot of problems with such limited items in stores- some stores had one or two racks and some had a lot more racks. Long lines, short patience, I understand the frustration. I can't even believe what I would do if I saw someone hoarding it to sell online like I've read about. But guys....... these are clothes. Be mad, be upset, but don't let this determine your whole day. I can't even believe I'm writing an entire blog post about it. I'm kind of just laughing observing from the side because this is WHY this exact demographic and audience of shoppers gets a bad rep. Lilly made their decisions to sell in Target and they made their decisions to only put a limited amount in stores for a limited time. That's THEIR decision. Yes, we're the consumers, but we're not completely the deciding factor in Lilly's business plan. For the most part, everyone just needs to take a step back and a great big breath. They are clothes. Sure, I got on this morning and was a little upset that it was already sold out, but wasn't that expected? I shrugged and was happy that I wasn't spending any more of my money. I hate to be all dramatic and philosophical about it. But honestly, there are other things in life. No need to get all bent out of shape. For everyone that got stuff, CONGRATS! Take your cute pictures and post them because I'm obsessed with it all and you probably look adorable. If you didn't, no worries! Don't buy the stuff being resold online because you're just feeding into exactly what made everyone so mad. 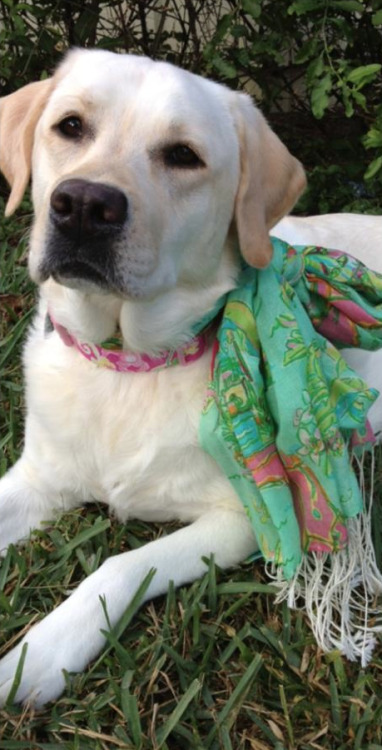 Take a breather and enjoy this picture of this cute dog wearing Lilly. But-- let me know what y'all think about all of this!! PS: Cracked myself up writing this blog post title... Getting Chilly for Target? Ha ha haaaa play on words, get it, chilling for Lilly? For Target? Okay bye I hate my jokes too. Hey Eliza!! Thanks so much for your kind words, "emotionally involved" is such a great term!! I have sadly heard that Target isn't planning to restock, which is what a lot of people want and are really upset by, but you know, I guess that's life maybe. Oh well. And I saw that post- absolutely too funny!! Fun fact- the first twitter picture is of the store in Richmond and two of my friends are in it!! I was one of the lucky people who got everything I wanted when the links went live early, and I have been excited about the collaboration since day 1. Even on a good day I can't afford to buy $200 dresses, but that doesn't mean that I don't want nice things. So I did stay up since I was writing a paper anyways, and I made sure that I was only buying what I felt I really wanted. Also, Target has said multiple times that they do not plan on restocking these items. Whether or not that's true, I don't know. Whether or not I think people should be upset with what was going on, I don't think that's my opinion. Because I would totally understand being disappointed after waiting for something for a couple months, but I don't understand people selling things on Ebay or Instagram for way above asking price. I also like that people who bought items are talking about their experiences and sharing what they purchased. I love this post Meredith! I wasn't able to find or buy anything so no Target Lilly for this gal! But it's just clothes anyways and honestly I don't need to buy something just because its cheaper compared to real Lilly! Thanks so much, Katie!! Totally agree!! Amen sister! I love Lilly just as much as anyone but no shift dress is worth that madness! Absolute madness!! Thank you, Brittany! LOVED THIS. As a not-so-prepster, I think Lilly stuff is cute but I don't really get the obsession. Totally agree with you - it's great to like it but people, CALM DOWN. This post makes me so happy to know that I feel the same way I do. I love the Lilly brand and Target, but I am currently too broke for either so I skipped out on purchasing anything. And after hearing all the horror stories, I was glad I did. Honestly I don't understand how some people got so bent out of shape for not being able to get anything. I understand that you love Lilly dearly but at the end of the day ITS JUST CLOTHES. There will be another time and another place when you can get more. In five years, you probably won't even remember about this incident. So thank you for explaining it all in better words than I could.